Just a couple of super simple cards to share today. I went to a Quilt Show with my Mum yesterday and afterwards we decided to head to Spotlight to see what sort of quilting things they had. (She’s interesting in quilting; I’m sticking with papercrafting!). Unfortunately, we didn’t see anything for her but we did see a couple of things of interest to me…uh oh! lol The Stained Glass die by KaiserCraft jumped out at me and straight into my basket! When I got home I decided to use it as a stencil and I love the effect. Materials used: Stamps – A Little Sentimental (Clearly Besotted), Cherry Blossom (KaiserCraft); Cardstock – American Crafts; Dies – Stained Glass (KaiserCraft), Project Life (Becky Higgins); Hero Arts Shadow Inks (Hero Arts). Whilst I really like the simplicity of the above card, I did wonder how it might look if I stepped it up a notch or two. Materials used: Stamps – A Little Sentimental (Clearly Besotted), Cherry Blossom (KaiserCraft); Cardstock – American Crafts; Dies – Stained Glass (KaiserCraft), Project Life (Becky Higgins); Rhinestones (KaiserCrafts); and Hero Arts Shadow Inks (Hero Arts). I like the extra bit of pizazz on the second but really I do like them both. 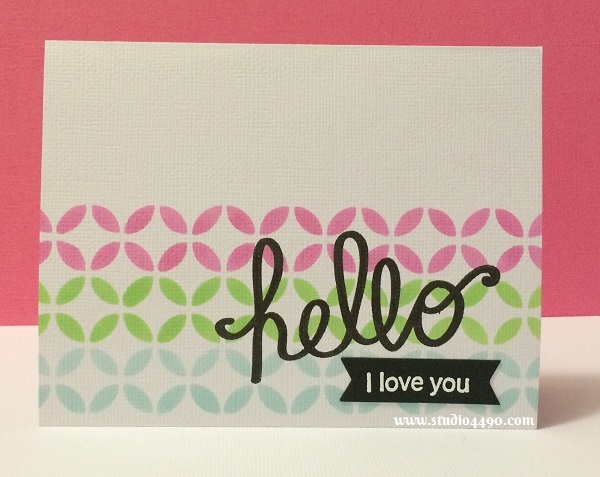 I ended up using my MISTI tool to stamp out the sentiment on the second card. 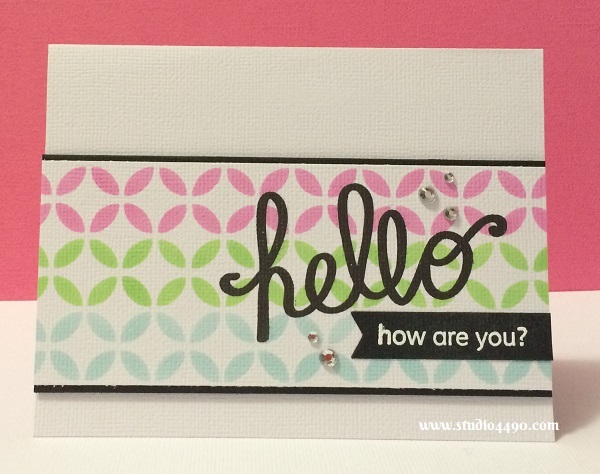 I used textured cardstock for both cards and the sentiment didn’t quite stamp completely for the first one. I used a black marker to colour in any spots. For the second card, I used the MISTI and it was so easy to re-stamp the image in exactly the right place ensuring complete coverage! I’m still playing with the die this afternoon so you can expect to see another couple of cards using it very soon. Hope you are all happy and well! Well, applauding that KC die for jumping into your shopping bag, because WOW…you’ve showcased its flexibility already in using it as a stencil! Clever…and the results are pretty x pretty! Colours and layouts are wonderfully eye-catching; perfect background for your ‘dramatic in black’ sentiments. I think they’re both equally as lovely! Stencils…be aware…they’re contagious! Wow! This is so amazing, Kylie!! I love that you used a die to create your own stencil. I’ve been meaning to do the same thing, but I always forget to – or, more often, I get distracted by other shiny supplies that are sitting out on my desk…. Love the big, bold sentiment, too. It packs a punch and really works with your gorgeous card. I’ve seen Misti in use, but I haven’t felt like I really wanted to buy it. I’ve already got so many different tools, that I fear it would sit somewhere in the corner, forgotten. I’m so glad you’re enjoying it, though! So glad you went shopping! So glad this stencil landed in your cart! What a duo of sweet, sweet cards! Love what you’ve done with this. That Misti sure is an amazing tool and I’m so glad I got one – it really does help make crisp clean images. Each of these is darling. You’re rockin’ the stencil girl!! Have a great week dear friend!!! Thank you so much, Bev! I’m loving it! I’m a big fan of the MISTI too! Isn’t it great! 🙂 Thank you! You too! hugs!